The brilliant neurosurgeon Stephen Strange is injured in a horrific car accident. 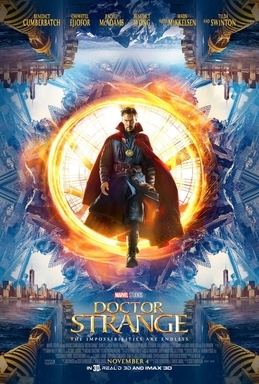 In order to regain his mobility – and to find direction in his life – Strange travels to Kamar-Taj, a secret compound in Nepal where the high sorcerer known as the Ancient One uses her mystical powers to defend the world. Strange benefits from her teaching and joins her cause. (SPOILERS AHEAD THE REST OF THE WAY). 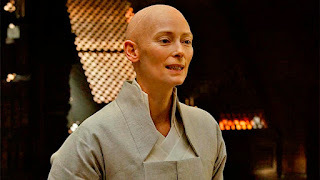 Strange and the Ancient One use dark power to good ends; they combat Kaecilius, a sorcerer and former student of the Ancient One who has summoned the dark being Dormammu in an attempt to bring eternal life to earth. The Ancient One’s disciple Mordu has a more rigid personality than Strange; Mordu becomes disillusioned with his teacher and his compatriot when he learns that they are using dark power; unable to believe that they could be using it for good, he leaves and becomes an adversary. Kaecilius kills the Ancient One before Strange and his team are able to force Dormammu to take Kaecilius and his disciples away from Earth. 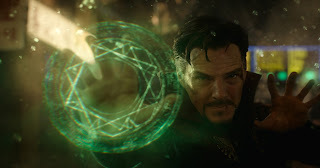 With the world safe from Dormammu, Strange can now try to protect the world from other threats, one of which may be the offended Mordu. There is no adoption storyline. The Ancient One does take in broken people and helps them find wholeness. In one scene, we see that Stephen has pursued medicine to extreme ends in an attempt to regain his functioning. A character says that this “isn’t medicine; it’s mania.” Folks who have spent years and fortunes on infertility treatments might relate to Stephen; it’s sometimes hard to judge how far to pursue medical solutions to emotionally important problems. Somewhere in the course of learning from the Ancient One, Stephen trades in his overinflated ego for a sense of duty and bravery. Stephen defeats a powerful evil being because of his own willingness to face death; meanwhile, the main antagonists (like many cinematic antagonists) are motivated by a deep unwillingness to accept death and loss. Loss is a part of life, and being able to accept and process it is necessary in order to functioning in life. One character says that life gets its meaning from death. Life also draws meaning from relationships, religion, love and many other things (not just death), and perhaps the line could have been phrased a bit differently to be more accurate, but most viewers seem likely to take the positive message from the line without taking it as overly gloomy. For many kids who have been adopted or in the foster care system, coming to terms with loss is an important part of processing their experiences and moving into a healthy adulthood. Some aspects of Stephen’s journey could be inspirational to some teenage viewers who have experienced loss or trauma. There is quite a bit of darkness and violence in the film. A librarian is decapitated by Kaecilius. A huge, surprising car accident leaves Strange bloodied and broken. A mentor character dies after being stabbed. (More spoilers here)… Stephen is killed multiple times, but uses his mastery of time to continually revive himself. Stephen seems to gloat in sending his enemies to an eternity of despair. Doctor Strange seems a bit dark and a bit violent for younger viewers, but teens 13 and up seem likely to enjoy it. The film presents an opportunity to reflect on loss, death, and how we let them impact our lives. Good for most teens 14 and up, and their parents. In the wake of a traumatic event, Stephen felt like he had no direction and no purpose. How did he find a new purpose? How can other people find meaning and direction in their lives after experiencing trauma? Mordu says that we “never lose our demons; we only learn to live above them.” What does he mean by this? Do you agree or disagree, and why? Have you ever had to do something that others would think was bad in order to achieve a good outcome? The Ancient One and Stephen believe it is possible to do that; Mordu disagrees. Who do you agree with, and why?